Greenland is warming, Greenland’s warming is melting its ice, and Greenland melting ice is raising global sea level. All true, but it all has happened before during the last 100 years or so. Our technology to extract small signals buried deep in noise from both our backyard and remote Greenland is unprecedented. This skill should not fool us, that the large changes that we see in Greenland and elsewhere have not happened before. They have, but memory is a fickle thing, as “new” is exciting, while “old” is often forgotten and considered unimportant. Those who live in the past are doomed to miss the present, those who ignore the past, are doomed to repeat it. We need to learn from the past, live in the present, and prepare for the future. 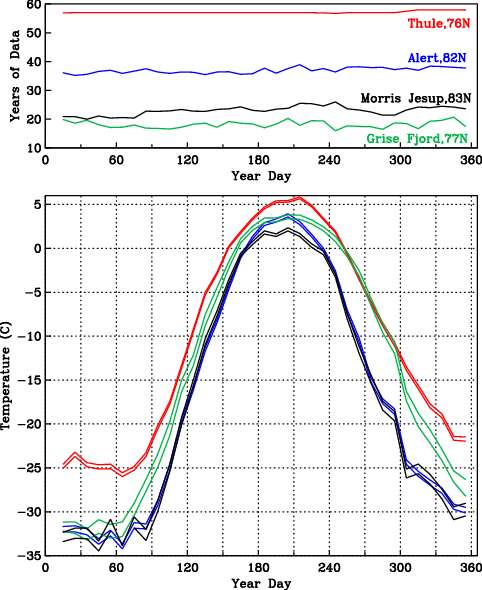 Annual cycle of air temperature (bottom panel) from south to north at Thule (red), Grise Fjord (green), Alert (blue), and Cap Morris Jesup. Data years (top panel) for each year day are degrees of freedom. For each place two temperature curves indicate upper and lower limits of the climatological mean temperature for that day at 95\% confidence. 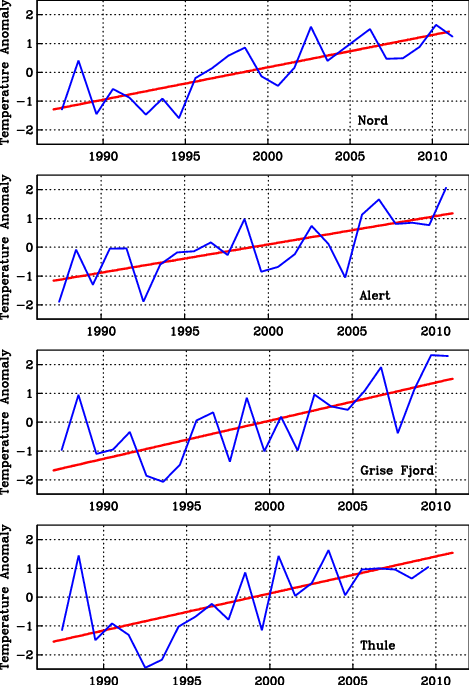 Annual averages and trends of air temperature anomalies for the 1987-2010 period for (top to bottom) Station Nord (Greenland), Alert (Canada), Grise Fjord (Canada), and Thule (Greenland). Scales are identical. The trends are fitted to daily, not annual data. The annual averages are shown for display purposes only. The air around northern Greenland and Ellesmere Island has warmed by about 0.11 +/- 0.025 degrees Celsius per year since 1987. North-west Greenland and north-east Canada are warming more than five times faster than the rest of the world. This must be huge (yes, it is), it must have an effect on the Greenland ice sheet (yes, it does), and this must raise sea level (yes, perhaps 10 cm or 3 inches in 100 years, Moon et al., 2012). The catch is that my records all start in 1987, because that is the period for which I have actual measurements from all those stations. My satellite record is even shorter: it starts in 2000, but with lots of work can be extended back to 1978. And my ocean record is shorter yet: it starts in 2003. There just are no other hard data available from north-west Greenland. So, does this mean we are stuck with the gloom and doom of a short record? No, but we have to leave the comforts of hard, modern data with which to do solid science. People have to stick out their necks a little by making larger scale interferences. Based on the 1987-2010 results shown above, I can now say that trends and year-to-year variations are all similar in Alert, Thule, Kap Morris Jesup, etc., etc., so I will use the 60 year Thule record to make statements that somewhat represent all of Nares Strait. I could also start looking for softer and older data. 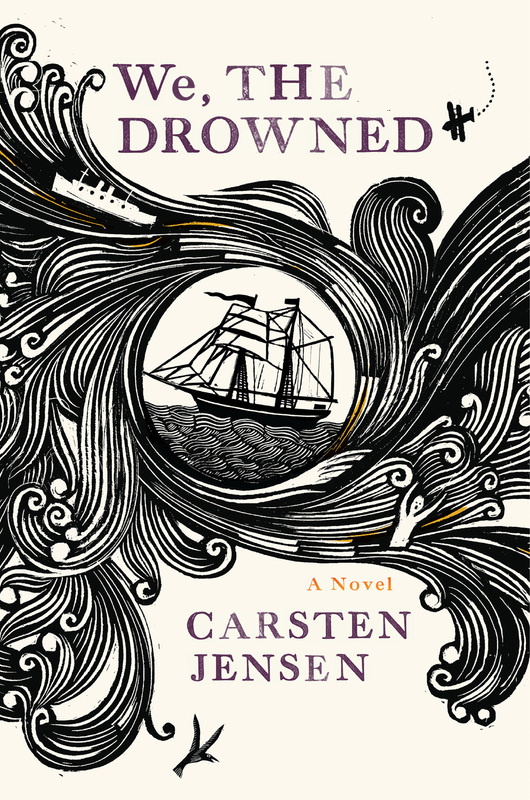 With soft data I mean sketchy ship logs kept by whalers, tense expedition reports of starving explorers (Lauge Koch, Knud Rasmussen, Peter Freuchen), and imperial expeditions (George Nares, Adolphus Greely). Data from Nuuk, southern Greenland, where the temperature record goes back to 1881 (monthly data from NASA/GISS). The dashed line indicates 1987. The trend is statistically significant, about 0.008 +/- 0.03 degrees centigrade per year or about 10 times smaller than what it is for northern Greenland starting in 1987. So the devil of Greenland warming, melting, and sliding to sea is in the details or records that are too short. 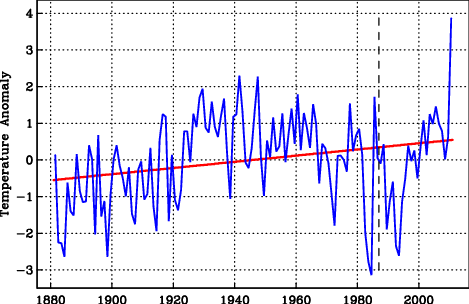 The Global Warming signal is in there, but how much, we do not know and perhaps cannot know. Furthermore, most of the globe of “Global Warming” is covered by water and the ocean warming we know little about. Recall, my ocean record off northern Greenland only starts in 2003 and ends in 2009 or 2012, if we recover computers, sensors, and data from the bottom of Nares Strait this summer. Greenland’s data and physics of ice, ocean, and air are exciting and all show dramatic change. To me, this is a big and fun puzzle, but one has to be careful and humble to avoid making silly statements for political purposes that are not supported by data. Do I think Global Warming is happening? Absolutely, yes. Do I think it is man-made? Probably. What do I do about it? I ride my bicycle to and from work every day. And that’s what I do next … bicycle home. 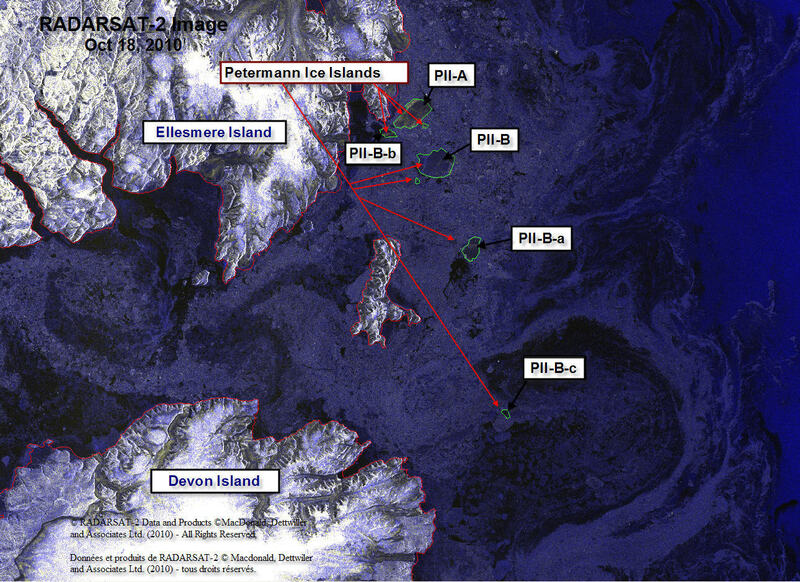 Several pieces of the Manhattan-sized ice island that broke off Petermann Glacier, Greenland in 2010 arrived, dispersed, and melted off Newfoundland last summer. They provided stunning displays visible to the naked eye from the coast. The Canadian Ice Service just distributed this set of radar images showing 4 pieces that are all grounded and/or stuck in ice. None are moving. In the open ocean ice is moved by winds stressing the ice from above and by ocean currents stressing the ice from below. Typical sea ice varies in thickness from 1-5 meters (3-15 feet) which is much less than the 30-130 meters (90-400 feet) thick ice islands. Winds thus push thick ice islands much less than they do push the thinner sea ice. Thick ice islands are moved by ocean currents, not winds. This is why oceanographers like myself love these bits of ice islands to bits: they tell us about the ocean below the surface that satellites do not see, but, sadly, all fragments are stuck either to the seafloor in shallow coastal waters or are cemented in place by immobile sea ice that is “land-fast:” Think of it as ice that is glued to land and to each other. This sheet of glued-together ice extends some distance offshore. The distance can be a few yards during a cold winter night in Maine or 100s of miles off Siberia. Offshore islands, rocky outcroppings, or grounded ice islands all anchor land-fast ice by adding local support and thus strength and stability to the immobile land-fast ice. Land-fast and mobile sea ice off Baffin Island with Petermann Ice Island PII-B1 grounded near the 150 meter isobath (black dot). Thick lines are 100, 200, and 300-m bottom depths. 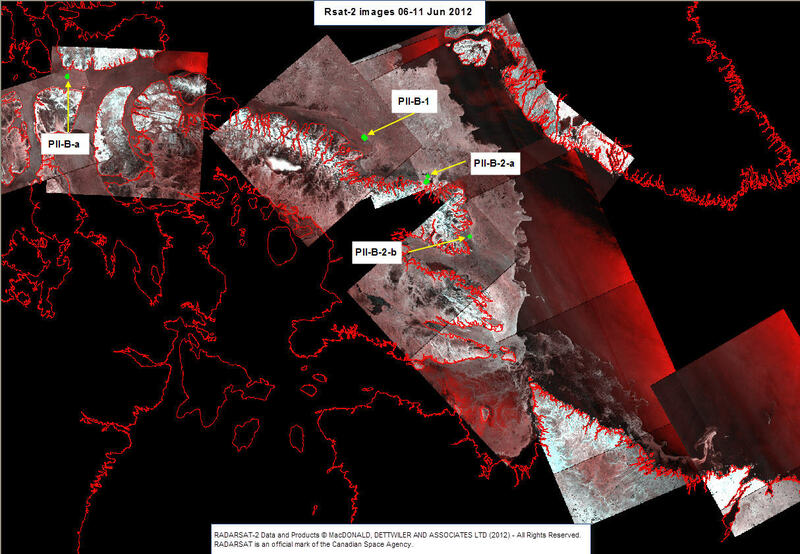 MODIS Terra data at 250-m resolution from June-6, 2012, 15:05 UTC. There is clearly a 30-km wide band of ice attached to the land with a line of blue water separating it from ice that is mobile and has different signatures. A blue band of ocean has emerged, I speculate, as the result of winds from the south that moved the mobile ice to the north-east (to the right in the image). Neither the land-fast nor the grounded ice island PII-B1 embedded in it moved, so open water appears where there was mobile ice before. This is called a shore lead and I bet there are plenty of seals and whales feasting there now. Note also the arched entrance to Home Bay (bottom left) where loose ice is scattered towards the headland of Henry Kater Peninsula. As summer is arriving fast in the Arctic, the land-fast ice will disappear, breaking up as the sun and air above and the ocean below weakens the ice by melting. This will expose the thicker ice islands and icebergs to wind-forced storms and waves more violently than it does now. 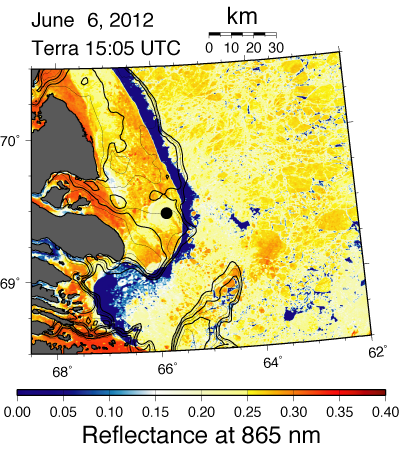 And even those ice island grounded to the bottom of the ocean in shallow water will become free during a time of higher than normal sea level, perhaps during a spring tide, perhaps during strong winds from the north. Then these currently stuck-in-the-ice ice islands will continue their journey south towards Newfoundland and the Atlantic Ocean that they began in 2010 when they were born in northern Greenland. EDIT: For context I append an earlier RadarSat image from October-18, 2010 when all segments were much closer in space.